Well, we didn't actually walk into a bar. By the headline, you may be expecting something to make you laugh. Consider your attention "grabbed". The union guy would be me - a dad who currently is part of a crew building the latest skyscraper addition to the city of Milwaukee's rapidly changing skyline. 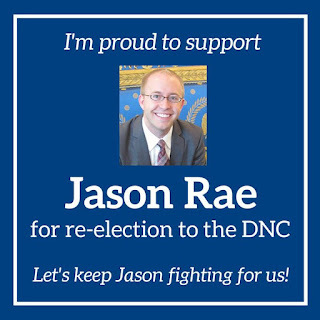 The DNC executive committee member is Jason Rae - a political dynamo who is creating an incredible amount of positive change as well. Did I mention that Jason is not "just" a member of the Democratic National Committee but part of the executive committee? That's huge. ("YUGE" even) Wisconsin has more than just a little say with what direction the DNC goes. We currently have a voice within leadership. I'm not going to make this into an extremely long post as I'm still getting ready to drive to the WisDems convention in Green Bay, but, I thought that there were a few things that people should be aware of. Initially they bought what was written about us. It was Jason who made the noise that got them to take us for what we are - an entity without political leaning who are solely committed to helping veterans either get a job, or, create jobs. (thank you Jason!) Anyone who stands up to WMC and can make them listen has a very special voice. Staying on the subject of "chamber of commerce", most people know that Jason is the executive director for the Wisconsin LGBT Chamber of Commerce. He has taken that group to receive some incredible national recognition. When I went through my transformation, I looked for help. We needed all of the allies that we could get in order to mount a counteroffensive. Jason was there. If anyone had a question, Jason was one of "thee people" to ask. Not only could you ask, but, you'd get an answer. At the heart of what makes me who I am is just a guy who busts his backside in order to provide a better world for his child. I appreciate the people in this world who spend their time making it a better world. Jason Rae is one of those people. I completely trust him. Complete trust doesn't come easy these days, but, he has it. It has been earned. He's had my back, and, I will watch his. So, who did he ask? He asked some guy that really isn't special in any measurable sense that sometimes limps to his car after work carrying a lunchbox who just cares about making things better. The only hesitation in accepting was allowing it to sink in that the conversation was taking place. Not just because it was me being asked, but, the situation of where we were. An everyday ironworker had been asked to nominate a leader of the DNC to be reelected. For a working guy, this tells me all that I need to know about who is going to stand up for people like me. For us. This at a time when Unions are under attack and fighting just to exist. If you are the convention this weekend, I hope you'll join me in casting a vote for Jason Rae. As a proud Union supporter, I will also be casting a vote for my Union Brother - Mayor of Glendale Bryan Kennedy.